When Ukraine celebrated Christmas a couple of weeks ago, there were ample reasons for pessimism about that long-suffering country’s future. The national parliament is often dysfunctional, even by Washington standards. Corruption remains rampant throughout society and government. The Russian Anschluss of Crimea is, for the moment, a fait accompli, and Russian troops and their local hoodlum proxies continue to occupy significant parts of eastern Ukraine. The economy is a mess, real purchasing-power is down, fuel prices are up, and the oligarchs who control much of Ukraine’s wealth have not shown themselves overly enthusiastic about economic and political reform. Ukraine has absorbed 1.5 million displaced persons fleeing Crimea or the war-zones of the Donbas – the rough equivalent of the United States being suddenly confronted with about 12.4 million internal refugees. The West has been largely supine in the face of Russian aggression in Ukraine; the West remains helpless in the face of the barrage of lies and propaganda the Russian media and Russian-paid internet trolls spew around the world. Yet confronted daily by this long menu of distress, the people of Ukraine have remained remarkably faithful to the 2013-14 Maidan revolution of integrity: the self-liberation of a people who braved the bullets of Russian-supported murderers and swept a new government into power almost two years ago. The Ukrainian leaders with whom I’m in regular contact give the post-Maidan government grades ranging from B-minus to C-minus; they give Ukrainian civil society an A, for both its steadfastness and its patience amid sluggish reform, Russian aggression and a massive refugee crisis. This patience, which is complemented by a gritty determination to see real legal and economic reforms take hold, is all the more striking in that Ukraine must confront daily the cultural and social deterioration created by the sad reality of Homo Sovieticus: men and women who grew up under a brutal political system that was built on falsehoods, that maintained itself through terror, and that taught everyone that trust in another human being can be very costly. The lessons driven home between 1932 and 1945 – the years of the Soviet-managed terror-famine, the Holocaust and World War II; the years when Ukraine was arguably the most dangerous place on earth – remain toxic to the third and fourth generation: truth is dangerous, trust is dangerous, solidarity is dangerous. Homo Sovieticus remains a great obstacle to fulfilling the promise of the Maidan revolution in Ukraine. But those who bet that the reflexes of Homo Sovieticus would extinguish the flame of moral conviction that was the core of the Maidan in 2013-14 were proven wrong then. Why? Because another idea of the human person – free in the truth; responsible; capable of fellow-feeling and solidarity; willing to sacrifice for the common good – made the Maidan revolution in Kiev and throughout Ukraine possible. Many communities of faith and conviction helped challenge Homo Sovieticus in those stirring days. Indeed, one of the most under-reported aspects of the Ukrainian revolution of 2013-14 was its intensely religious character, which reflected an intensity of ecumenical and inter-religious co-operation unheard of in Ukraine’s history. That inter-confessional solidarity continues today; it is one of the signs of hope during Ukraine’s 2016 Christmas-at-the-crossroads; and at the centre of that solidarity are the leaders, clerical and lay, of the Ukrainian Greek Catholic Church [UGCC]. Two of those leaders, Major-Archbishop Sviatoslav Shevchuk and the UGCC’s “foreign minister,” Bishop Borys Gudziak, are the heirs, by episcopal consecration and conviction, of the heroes of the UGCC in the 20th century: the Venerable Andrey Sheptytsky; Cardinal Josyf Slipyj; Cardinal Lubomyr Husar. One of the Church’s principal lay leaders, Dr Myroslav Marynovich, is both a veteran of the Soviet gulag and a world-class scholar. 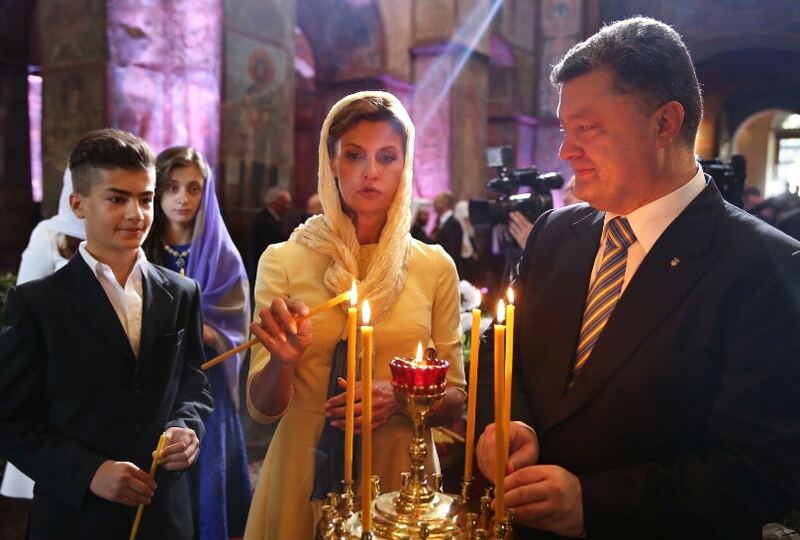 If Ukraine’s political leadership mirrored the courage and insight of its Greek Catholic leadership – whose influence is considerably greater than Ukrainian demographics might suggest – a country at the crossroads would, in the year ahead, find itself pointed in the right direction. The UGCC’s efforts to deepen and extend the revolution of integrity that triumphed on Kiev’s Maidan in 2013-14 deserve the support of fellow-Catholics throughout the world: not least in the Vatican. Next articleWhat can we do about irregularities in the celebration of Mass?